Good morning everyone! Happy Monday! The image above is how I'm feeling after all the money I spent this weekend. There were some sales this weekend, so the wife and I went with my parents to the Outlets near us and bought a whole bunch of work clothes. Spent a couple hundred on that. The more interesting story; however, is that we also made some purchases towards our costumes that we're making for Dragon*Con. I got a really nice pair of steel-toed leather work boots for about $50. They're pretty much dead-ringers for the kind of boots that Mario, Luigi, Toad, and Yoshi wear in Mario. This is perfect because I'm working on making a Toad costume. Specifically, the Toad Brigade Commander. My wife is going as a modified Princess Rosalina (shorter, more summery style dress). Alright, my whole weekend story aside, what did everyone else do? How was the weather? Break any laws? Also, the unofficial topic for today is video game heroines. Who are your favorites? Who are your least favorites? Marin is definitely one of my favorites. My top 3 most favorite female Zelda characters would have to be 1) Midna; 2) Spirit Tracks Zelda; 3) Marin. 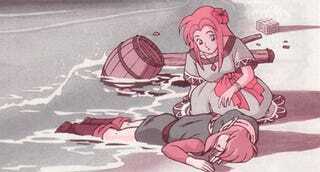 I always get misty eyed at the scene at the beach where Marin tells Link how she wants to leave the island. Then, if you get the good ending...well...spoilers. For some spoiler free fun (or maybe it's full of spoilers. I don't know. I'm not a mind reader. ), head over to TAYCLASSIC to continue the conversation. I've heard Kaepora Gaebora say that he thinks it's a hoot!